Taken together these two stretches of 'Atlantic Drive' provide a spectacular journey with breathtaking views and can be completed in a vehicle or by bicycle or even on foot. 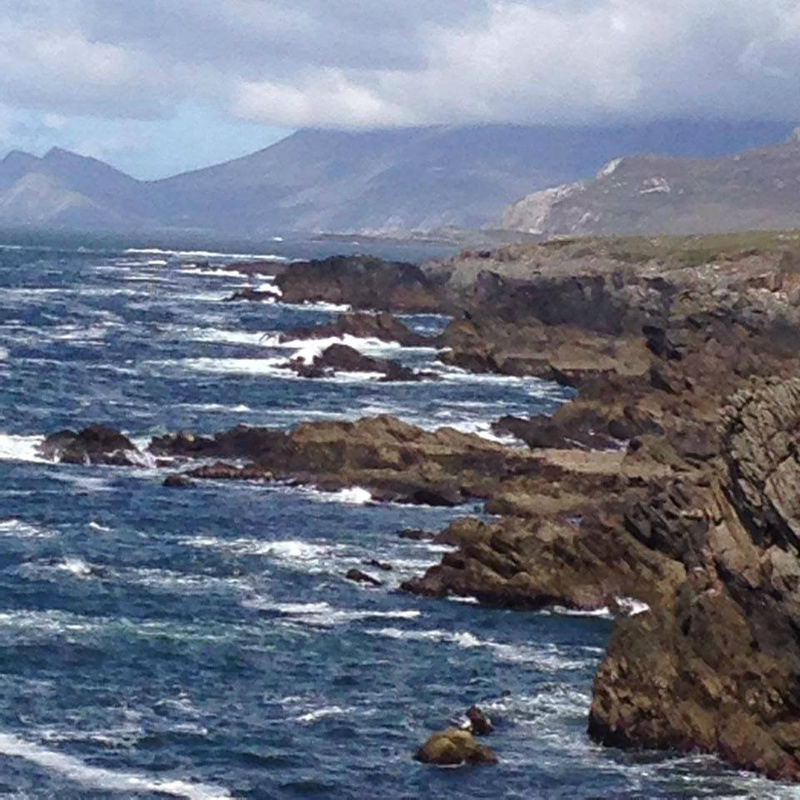 The first section of the Atlantic Drive begins at Mulranny, close to the junction between the main N59 road and the R319 that leads to Achill. Approaching from the Mulranny side of this junction, the exit for the Atlantic Drive appears on theleft hand side, prior to the larger junction. It is signposted 'Currane'. From the Michael Davitt bridge at Achill Sound - the bridge that connects Achill Island to the County Mayo mainland - proceed through the village of Achill Sound. About one mile from the bridge you will approach a wooded area. Take a left turn here, signposted the 'Atlantic Drive' (along with several more signs for localaccommodation). The roadside at the beginning of this stretch has spectacular rhododendron plants from mid-May to June. Follow this road for about 5km, through the villages of Shraheens and Derreens to Cloughmore. You will pass directly by the historic church and graveyard at Kildavnet and then the remains of the 16th Century tower house. 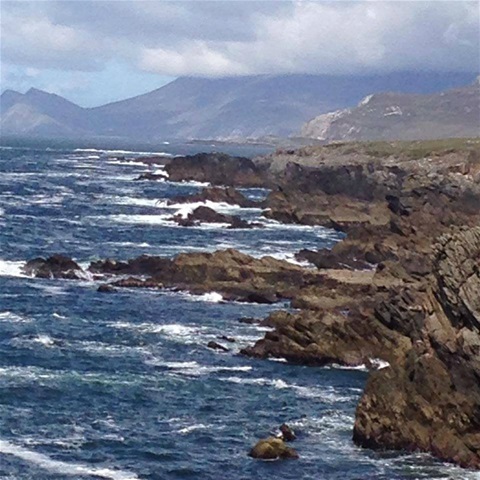 The waters of Achill Sound will be to your left and on the opposite side of this channel is the Currane Peninsula, with the 524m peak of Curraune Hill dominating the skyline. Kildavnet or Kildownet (Cill Dambhnait in Irish) Castle is located on the south-eastern shore of the Island, overlooking the waters of Achill. The placename literally means “the small church of Davnet” and refers to the 7th century Saint Dympna who built a small church here. The castle is said to have been built by the O’Malley Clan in about 1429. However it is best known as the home of its most famous tenant, the legendary pirate queen Granuaille (Grace O’Malley). Kildavnet Castle is a couple of hundred metres along the shore from the ancient church for which it is named. It is a fine example of a 15th-century Irish rectangular tower house. This three-storey building stands about 12m (40ft) tall and has buttress fortifications at the top. There is no stairway from the ground or first floor levels and access to the upper storeys is not possible. It is vaulted above the first floor, and a hole at the corner of this vault is the only access to the higher levels. The Tower stands at a strategically important spot, guarding the waters of Achill Sound which links Clew Bay to the south with Blacksod Bay to the north. 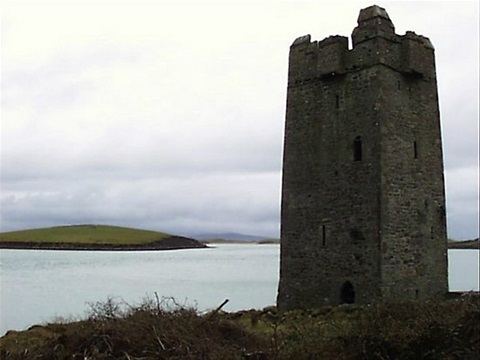 During the time of Granuaille it was one of several such strongholds that she controlled, including the Tower House on Clare Island and Rockfleet Castle. 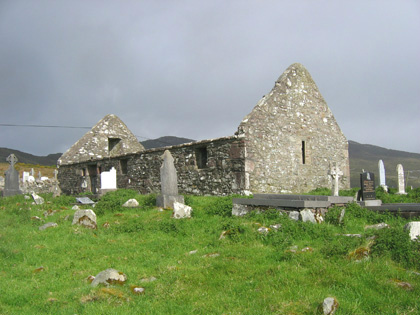 One of the earliest manmade attractions to halt by is the church and cemetery at Kildavnet, named for a 7th century nun on the run called Saint Dympna. This lass was a daughter of a pagan king of Oriel who, after the death of his wife, reckoned his daughter would suit his bed just as well. The mad old king duly chased the terrified Dympna all the way to Achill where the sprightly virgin managed to catch a boat to Geel in Belgium. Here she set about devoting her life to the Christian God, only to find her life considerably shortened when her father caught up with her unawares and lopped her head clean off with his sword, at which point he was cured of his insanity. Dympna duly became the Saint of Sanity and hence the number of mental health institutions around the globe called Saint Dympna's. The present church dates to the 18th century and contains the graves of many islanders who perished during the Great Famine. (Mayo was the worst affected county in the famine with some 350,000 inhabitants perishing or emigrating across the Atlantic). It stands on the site of another church, built by Grace O'Malley, the Pirate Queen of Connaught, so that her household staff could nip down from nearby Kildavnet Castle and confess their sins. Kildavnet is a fine example of a 15th century Irish tower house, a slim 13 metre high stone-roofed keep, built by Grace's grandfather. It's worth spending a moment here, reading the gravestones, pondering the waters and the sands, trying to envision how life was on Achill. Just a short walk along the shore line to the right of the church you will find the Holy Well of St. Dympna which is said to contain some cures.